We all have those friends…ones that thrive on jokes and pranks and can at times be pretty clever. My life is filled with people like that which makes for some pretty funny stories. How did Winnie The Pooh end up drunk on my bed? Once upon a time, a few of the band guys and wives gathered at my house for dinner. It was going to be an outdoor work party, but with the rainy weather it turned into dinner. I had plans to see a play later in the evening, so when it was time for me to go, I told the gang I would clean up later, and that they could stay as long as they wanted and lock up when they were done. I should’ve paid more attention when I heard the first few notes of Old Time Rock and Roll being played on the guitar. As I drove away I hoped there would be no hookers and booze like when Tom Cruise was left alone. The hallway looked emptier than usual. And why was the coffee table so tiny? It was made out of solid wood, and I knew it didn’t fold, so how was it so low to the ground? There were books and knickknack on the surface, and when I lifted up the tablecloth underneath them, I finally realized it was actually the bookshelf from the hallway, laying flat on its side. 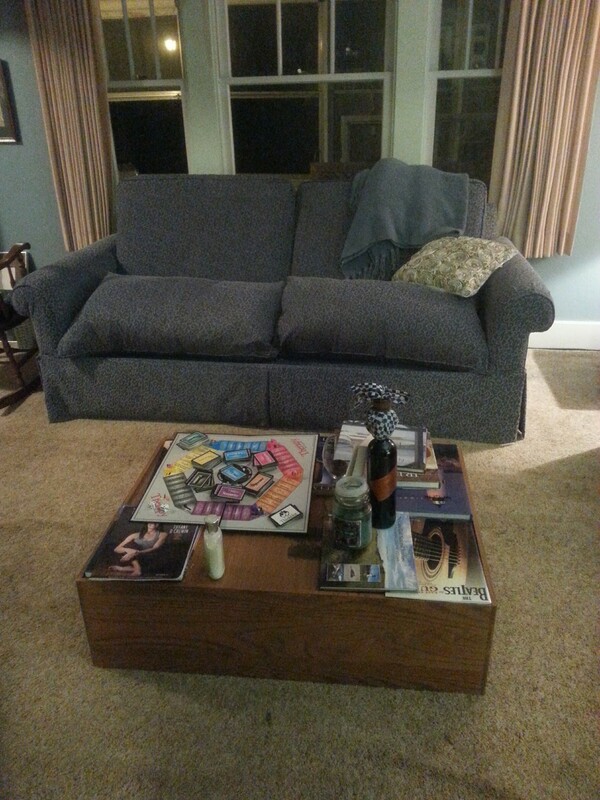 The couches had been switched and the pillows moved back, so they were on the opposite couches. On to the dining room where all chairs were mysteriously missing, and the pictures on the wall had been switched and in some cases turned around backwards. 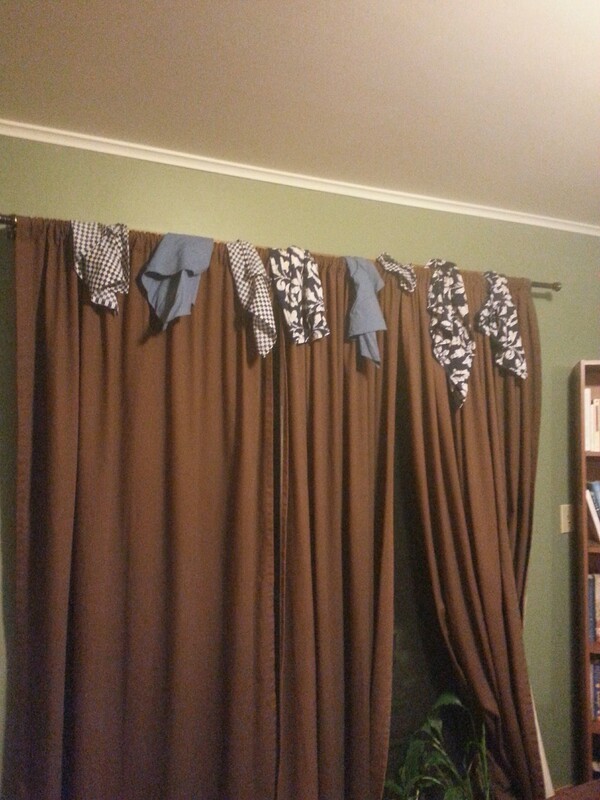 Everything on a surface of the dining room had switched shelves or furniture, and all the napkins were hanging from the curtains. As we moved into the kitchen, every cupboard door was open and things were clean, just very out of place. Upstairs in the bathroom, things had changed places and more pictures were askew and backwards. Michelle and I kept laughing and laughing as we moved from space to space noticing everything. We put a few things back into place, then I decided it was time for bed; I had to work very early the next morning. 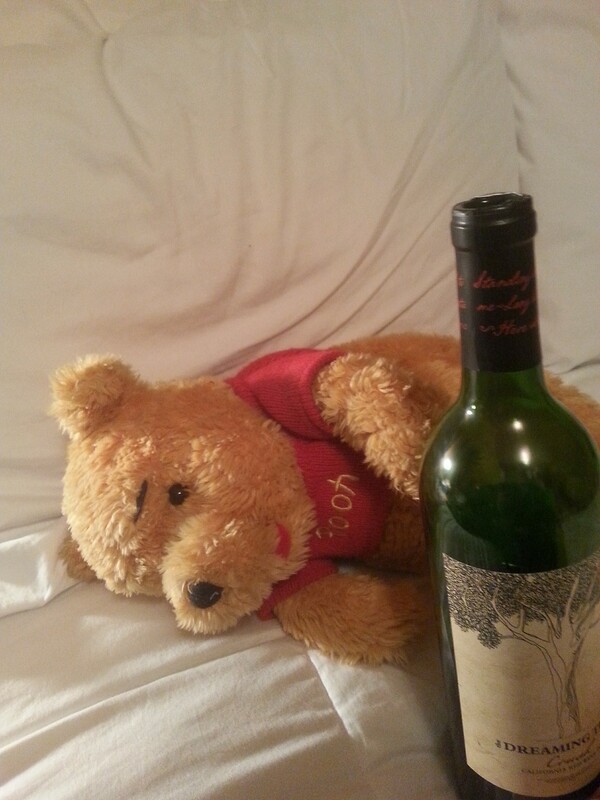 They left me an empty wineglass and a half empty bottle of wine, next to my Winnie The Pooh. I posed him for a drunken teddy bear picture to text out. I saw that the duvet had been moved and thus found their last trick, short sheeting my bed. It took me a while to get to sleep that night. I would like to say it was because I was busy plotting revenge, but my mind just doesn’t work that way. It’s just not in the cards for me. I still keep one picture in my bedroom purposely turned around just to make me laugh about the people in my life who keep me smiling every single day! And last weekend when I had some friends over working at the house, you can bet it wasn’t one of those hooligans I left in charge!